The Pebble E-Paper Watch for iPhone and Android is a Kickstarter project,and is expected out a little later this year. Kickstarter is a really interesting concept, with a lot of brilliant ideas getting crowd sourced funding to turn ideas into products. So it’s a smartwatch. There’s apps written, and apps being written. More on that later. But the first really great feature of the Pebble, is its screen. It’s no LCD / LED or the like, it’s a 144 x 168 pixel display black and white e-paper display. That choice of screen means the watch will be easier to read when outside, suffering less from glare, and with higher definition than LCD / LED. The watch screen is always-on, that is always displaying something on the face, and is backlit for night use. Click the thumbnails below to see enlarged version of the images. The Pebble is constructed of a plastic case, anti-reflective, shatter resistant lens, and a rubber strap. It charges via a USB cable connected to a computer, or a wall USB charger. Fully charged, the rechargeable battery will run for around about 7 days. The Pebble pairs with your smartphone via Bluetooth. Taking a leaf from Apple’s playbook, Pebble will launch a watchapp store to add functionality and customisation for owners. Runkeeper is one popular smartphone app you can expect to see play nice with The Pebble. The initial colour range will be white, black and red – or, to give them their marketing language colours, Arctic White, Jet Black and Cherry Red – with a fourth colour to be chosen by public vote. The Pebble has been three years in the making so far. When the makers put this project on Kickstarter, they were after $100,000. At the time of writing, they have almost 60,000 backers, pledging almost $9 million, with still 10 days to run on the funding window. September 2012 is the estimated delivery time. 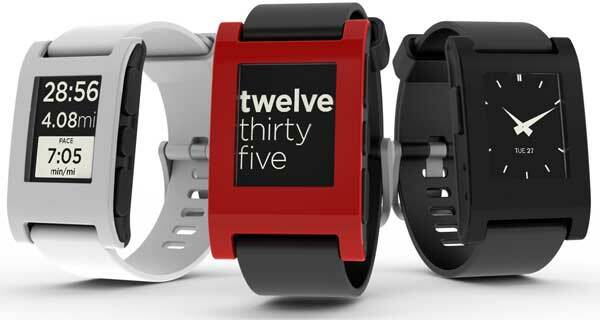 The price of The Pebble is expected to be around the US$150 mark, excluding freight. Pledge US$115, and you’ll be sent one of the watches. As stated above, pledges are open for another 10 days, at The Pebble E-Paper Watch page on Kickstarter.